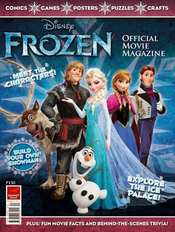 Disney Frozen Magazine Just $14.50 A Year! You are here: Home / Great Deals / Disney Frozen Magazine Just $14.50 A Year! You can subscribe to Disney Frozen Magazine for just $14.50 A Year! That’s 50% savings! Just use code: GROCERYSHOPFREE at checkout!